The biggest Liga Adelante game of the season. First against second, pitting the clubs with two of the biggest fan bases and most successful histories in the Spanish second division against each other. With no La Liga action this weekend due to the international break, it seemed an obvious way of spending a Sunday evening in Madrid. Rayo Vallecano are traditionally Madrid’s third team, with a history of bouncing between first and second divisions, and past players of the calibre of Laurie Cunninghan and Hugo Sánchez. The last decade has been disappointing, but recent seasons have seen them back on the up, and a 4-2 home win over Córdoba in early February saw them top the La Segunda table. 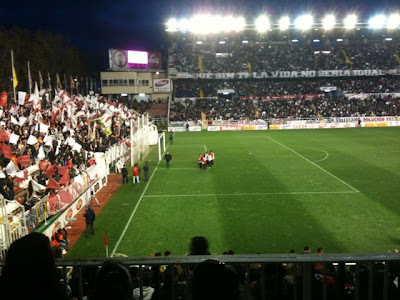 It seemed Rayo were set for return to the top flight for first time since 2003-04. Within a few weeks though the club was in turmoil. On 27th February the team walked onto the pitch before a game at relegation threatened Huesca carrying a banner saying ‘Basta de impagos’ or ‘enough with the not paying us’. Huesca won 4-1 and Rayo began to tumble down the table. Players spoke in the media of only receiving wages for seven of the last 18 months. Club president Teresa Rivero responded by stating that if they wanted to act so unprofessionally then she wouldn’t pay them at all until the end of the season. 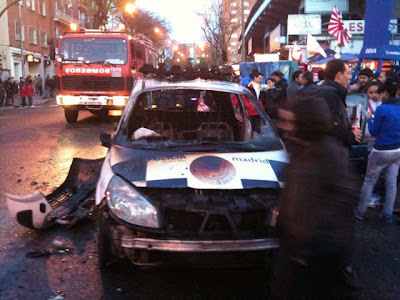 Class-struggle at Rayo wasn’t a surprise. Rivero’s husband José María Ruiz Mateos heads the controversial and now struggling Nueva Rumasa business empire, and was once close (too close) to Franco’s governing elite. Meanwhile, Rayo’s roots are in the working class barrio of Vallecas and its left-leaning fans are known for flying Che Guevara banners and pre-civil war Spanish Republic flags. Not an ideal match, then, in fairness. 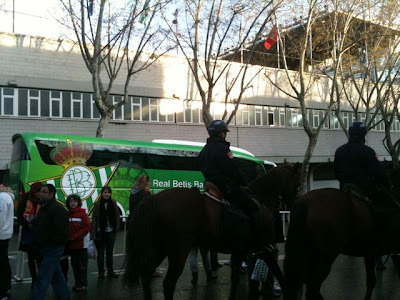 Such culture clashes between fans and owners are easily recognisable for Betis fans. Monty Burns look- and act-a-like Manuel Ruiz de Lopera finally left last summer after 18 controversial years in charge, the last four of which featured increasingly angry fan protest amid ongoing judicial investigations into financial shenanigans at the club. Lopera's sale to fellow oily-haired businessman Luis Oliver was ruled void by the investigating judge, who handed control of the club’s shares to a fan’s grouping lead by Betis legend and former Spain left-back Rafael Gordillo. The fans rejoiced but Lopera and Oliver are still fighting the decision, and no end seems in sight. Despite the off-field problems Betis started the season in flying form, topping the table with some impressive performances (including a 4-0 home win over Rayo in October) and even beating an almost full strength Barcelona in a Copa del Rey second leg in January (although FCB went through easily on aggregate). Then - in typical Betis fashion - the wheels came quickly off and four consecutive defeats post the winter break, along with more stories of financial woes, saw them slip out of the automatic promotion places. In recent weeks though both teams have been avoiding off-field matters and concentrating on getting back in promotion form. This resurgence has been helped by stuttering from their closest promotion rival Celta Vigo, including a 3-0 home defeat to Recreativo Huelva on Saturday evening. This meant Betis went into Sunday's big game a point ahead of Rayo at the top with Vigo a further three points back. Adding spice to the tie was that Betis coach Pepe Mel had previously spent four seasons in charge at Rayo, leading them up from the Segunda B in 2008 before feeling Rivero's boot in February 2010. Also, Betis’ Brazilian central midfielder Iriñey and leading scorer Ruben Castro had previously spent time in Vallecas. It all seemed very nicely set up. I’d not been out to this part of Madrid yet, so I collected my ticket early and spent a few hours before the game doing a bit of an explore. Vallecas has more of an ethnic mix than other parts of Madrid - with South American chicken restaurants, North African hairdressers and Chinese supermarkets alongside the more typical Spanish style shoe shops, patisseries and pokey bars on every corner. 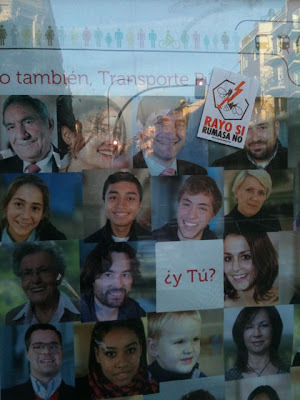 Some vacant retail units were plastered with posters advertising recent protest marches against Spanish government cutbacks, while bus shelters were decorated with anti-Rumasa stickers. My favourite was the one showing the company’s bee symbol getting hit by a ‘Rayo’ lightning. There were also plenty of green-scarved Betis fans having a beer on streets around the ground, mingling easily with the home supporters. The only angst visible was directed at the Rayo board. There was a heavy enough police presence, with mounties clip-clopping around, but a generally relaxed mood. Having said that, an hour before kick off about 20 masked fans set fire to a squad car and started throwing bottles at the police, who responded with batons and arrested the troublemakers. I was in a nearby bar having a beer and a calamari sandwich at the time. When I arrived fans of both teams were posing for photos by the car’s shell and there was no more hint of trouble. 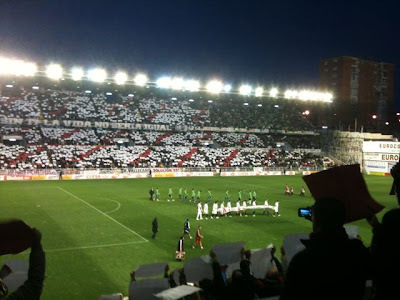 Inside, the stadium rang with chants of ‘Rayo si, Rumasa no’ both before kick off and during the game, while banners displayed around the compact 15,000 seater ground included the easily translatable ‘Rayo Vallecano Solución Ya’. My Spanish didn’t stretch to understanding the longer anti-Rivero songs, but the word ‘puta’ was regularly audible. Then at the 15 minute mark the home fans all round the ground simultaneously held up red and white cards, and chanted ‘Rumasa vende ya’, or ‘Rumasa sell now’ . This refrain would have been very familiar to Betis fans. Their version - ‘Lopera vete ya’ or ‘Lopera go now’ - had the same tune and stresses. With all this anger and energy being vented it was not surprising that Rayo began the game at full tilt. The noise from the ultras behind the goal to my left never let up, with the fans bouncing up and down constantly and screaming at any meaty challenge (especially from Rayo right back Coke) or half-chance for the home side. An early header from a corner flashed just wide, and Rayo looked most likely to make the breakthrough. As the game settled down however, most fans in the seats around me got increasingly nervous. Betis were content to sit tight and look to break with Iriney comfortably controlling the midfield, while up front Emaná’s quick feet looked the most likely source of a goal. The constant picking, splitting, chewing and spitting of ‘pipas’ (sunflower seeds) betrayed the crowd's growing unease. Betis came out with more attacking intent after half-time, and Ruben Castro had a powerful snap-shot well saved before Molina’s shot grazed the bar. The Betis travelling contingent in the far top corner of the stadium were by now in good voice, as were the many Beticos sitting among the home fans. One guy in green below me in particular was regularly on his feet, prompting volleys of mostly good natured abuse from his neighbours in red and white. The home fans, as per usual, were in good voice. There's often a better atmosphere here than at city neighbours Real Madrid. As the game went on more and more of the home fans’ anger was directed towards ref Amoedo Chas, and he perhaps understandably let it get to him. Twice mass howls of ‘mano’ and ‘amarilla’ lead to harsh bookings for deliberate handballs from Betis players, while Rayo centre-forward Aganzo just saw yellow for a nasty challenge that ended Betis centre-half Belenguer’s involvement. Then on 66 minutes Belengeur’s replacement Arzu couldn’t properly clear a simple cross. Rayo forward Piti quickly controlled the dropping ball at the edge of the box before arrowing a left footed volley in off the post. Cue much more frenzied jumping and screaming and Europe’s ‘The Final Countdown’ over the stadium’s speakers. Both managers quickly made a few changes, but Rayo's Sandoval's worked better and they saw the game out with few problems. Their fans behind the goal relaxed a little - and at one point displayed a long banner proclaiming ‘No a la guerra imperialista en Libia’, before greeting the final whistle with a long rendition of ‘El Rayo es de la Primera’. My view of the game on the journey home was that the home fans' passion and energy won the day, with a weak ref letting himself be bent to their will. Someone without a soft spot for Betis might argue, equally persuasively, that a tight game between the division’s two best teams was decided by one moment of class from a Rayo player. Either way it was an excellent night’s entertainment and neither club will be over disappointed with their weekend. With Vigo still struggling, it looks likely that both will be playing top flight football next year, unless more off-field problems intervene. For more of Dermot's work, head to his website at HERE.